PICTURE YOURSELF living in a luxury residence high atop a bustling city, close to amenities and services yet far away from the community below. Perched high up in the Brentwood Burnaby real estate district is Vantage by Embassy, a new Burnaby high-rise condo tower that will redefine what luxury condominium living means to homebuyers. This premiere Brentwood Burnaby real estate tower will provide unparalleled living spaces, contemporary finishes, well designed floor plans and exceptional amenities. Not only that, the Vantage Burnaby condos for sale will provide the most amazing panoramas and views from all directions in addition to modern living features that include the finest materials and designs for residents. The Embassy Development tower at the Brentwood Burnaby Vantage condos for sale is the finest address in town, close to entertainment, public transportation, top rated schools, great dining options and lots of shopping. Also within walking distance to the pre-construction Burnaby condos for sale at Vantage by Embassy Developments are numerous green spaces and urban parks for you to enjoy. The Vantage Burnaby condo tower is designed by award winning Chris Dikeakos Architects Inc. and the residences will be available this Spring 2011 during it’s grand opening presales launch. The modern Vantage Burnaby condo tower is a statement in itself. If the initial renderings from the architect are any sign of its prestige, the Embassy Vantage Burnaby condos for sale will be unmatched by any other development in the region. The luxurious lobby features custom tiles, soaring ceilings, magnificent chandelier, extensive wood paneling and a resident Concierge desk. Inside the pre-construction Burnaby Vantage condo tower will be tonnes of amenities that inclue a fitness gym, kitchen equipped social clubhouse lounge, change rooms, sauna and whirlpool. The green spaces surrounding the pre-construction Burnaby condos at Vantage Brentwood condominiums are beautiful and a great place for you to entertain or spend time with neighbours. From top rated universities and schools to major shopping destinations and public transportation including bus and SkyTrain, the Burnaby Brentwood real estate district is primed for the big time. Not only that, just steps away from your front door at the Burnaby Vantage by Embassy condos include Bosa Foods and Save on Foods in addition to lots of trendy restaurants and parks. For more information about the pre-construction Burnaby condos at Vantage by Embassy and to register for the launch of presales, please visit www.vantagebyembassy.com today or you can also call 604.294.2251. Central, connected and incredibly convenient. A modern residence of condominium homes in the Brentwood neighbourhood of North Burnaby real estate market with spacious condo floorplans, superb amenities and sweeping panoramic views. At Vantage Burnaby condo tower, you are perfectly positioned in a Brentwood neighbourhood near major shopping and transportation. 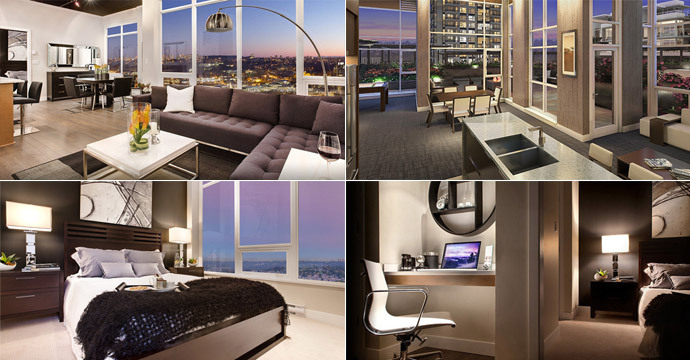 The inspired convergence of location and luxury Burnaby condo living. Coming this Spring 2011! Here are some of the features presented at the pre-construction Burnaby Vantage condos for sale. All homebuyers will have the ability to choose between 2 designer selected colour schemes by Christina Oberti: Classic or Contemporary. In addition, all homes at the Vantage Burnaby condos for sale will have over height nine foot ceilings and large windows for views and natural light. The pre-construction Burnaby Vantage condos will also have full sized laundry closets with full size washer and dryer in addition to large balconies that extend your living space outwards. Also presented are large baseboards, moldings throughout and durable hardwood laminate floors in the den, dining, living room, kitchen and entry foyer. The Burnaby Vantage condominiums will also have luxurious loop-tip sheared carpeting in the bedrooms in addition to pre-wiring with dimmer in the dining room. All homes will have rough-in for security alarm systems and will come with the National Home Warranty (standard coverage). 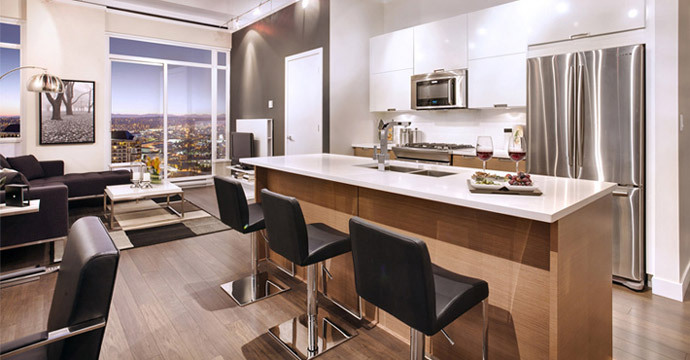 The classic scheme palette at the presales Vantage Burnaby condos will have horizontal wood grain Wenge veneer cabinetry with matte chrome hardware in addition to granite countertops with full height stone backsplashes and built in desk countertop. Also, there is a stainless steel package included which also has a slide in gas convection range and an under counter wine fridge for the homes on floors 31 and 32. The bathrooms for the classic scheme at Vantage Burnaby condos for sale in Brentwood will have a deep soaker tub, Wenge veneer cabinetry, granite countertops, large format tiles, frameless clear tempered glass shower doors, ceramic wall tile, chrome hardware and dual flush toilet. The contemporary scheme at the new Burnaby condos at Vantage by Embassy will introduce high-end features as well and have rift white oak veneer cabinets and polished quartzite counters in the kitchen and bathroom. Extra touches are included in all of the new Burnaby Vantage penthouses for sale that include your choice of gas fireplaces in the living area, tailored stainless steel appliance package that includes top end appliances from Broan, Electrolux in addition to imported tile shower bases, full sized stacked washer and dryer as well as extensive outdoor living spaces with a fireplace, built in barbeque and food prep area. Coming soon to the Brentwood neighbourhood of the Burnaby real estate market is a sophisticated condominium tower featuring luxurious suites for sael. The Embassy Development North Burnaby Vantage condos for sale will bring sophisticated luxury urban living to this promising area. This architecturally stunning 30 storey condominium tower in the heart of the North Burnaby real estate district will feature both two and three bedroom high-rise residences (many with dens and outdoor living areas) just steps away from the vibrant Brentwood Town Centre, soon to become Burnaby real estate’s finest address. Brought to you by Ryan Bosa and Embassy Development stay tuned for more information about the new Burnaby Vantage Condo Tower residences. So as a homeowner, you want only the best penthouse size and style correct? 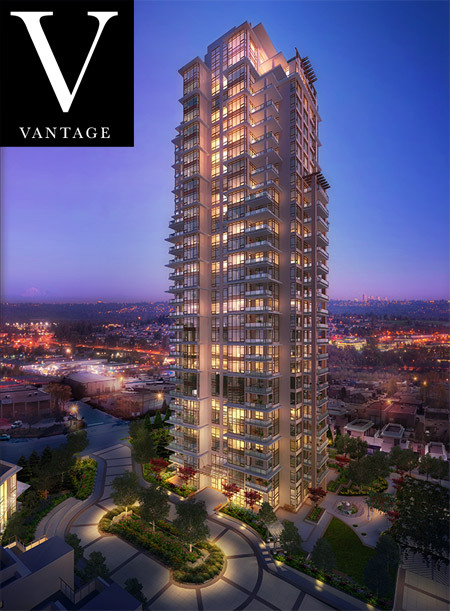 Well, we introduce to you VANTAGE Burnaby condo tower, the height of modern living. Located within the bustling Brentwood Burnaby real estate market district, this is the finest address in this part of town. The Brentwood Burnaby Vantage condos for sale offers sophisticated luxury in the Brentwood neighbourhood of North Burnaby real estate market. Thirty storeys of two and three bedroom Vantage Burnaby condo high-rise residences, just steps from Brentwood Town Centre, will soon be Burnaby’s finest address. Brought to you by Ryan Bosa and Embassy Development, Vantage is coming soon. Now taking registrations online at vantagebyembassy.com and presented by MAC Marketing Solutions. Stay tuned for more information regarding the pre-construction Burnaby Vantage condos for sale coming this Summer 2010!